Company: Apistogramma viejita (Viejita) are best kept with other small peacefull fishes. Aquarium setup: Apistogramma viejita (Viejita) is best kept in a densely planted aquarium with a lot of hiding places among roots and rocks. 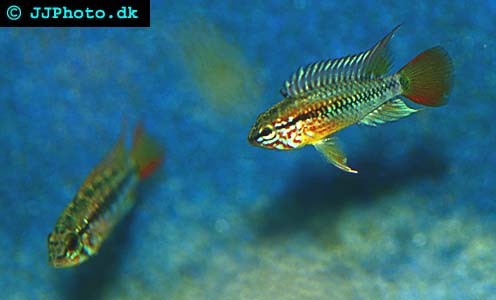 Apistogramma viejita (Viejita) is best kept in harem groups with 3-4 females for every male. Leave some areas open. Feeding: Apistogramma viejita (Viejita) accept flake food requires frozen and living food to breed. Breeding: Apistogramma viejita (Viejita) lays their eggs in caves, on roots or on the leaf of a plant. The female lays a smaller number of eggs. The female guards the eggs and the fry while the male guards his territory which may contain several females with fry. Our knowledgeable staff usually responds to any question within 24 hours.